Professor Welton established one of the earliest cat circuses, performing on rooftop gardens and in Vaudeville theatres in the late 1800s. The show featured feisty felines boxing in a miniature ring, wearing tiny boxing gloves to prevent injury. Although most fondly remembered for their martial arts prowess, the cats also rode little bicycles, turned somersaults, and did other amusing tricks. Today there are a number of cat circuses playing to ever-increasing audiences. These include Samantha Martin’s Acro-Cats, Dominique the Catman’s Key West shows, Yuri Kuklachev’s Moscow Cats Theatre, and Gregory Popovich’s Comedy Pet Theater. 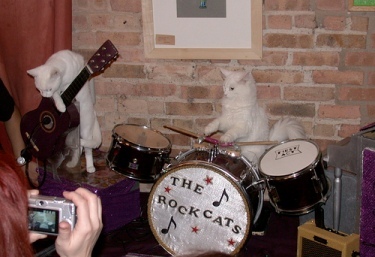 Samantha Martin’s Acro-Cats are Chicago-based feline performers that ride skateboards, roll barrels, push shopping carts, jump through hoops, ring bells, climb ropes, run agility courses, and play musical instruments (the Rock Cats band). Martin, who has over 20 years of experience as an animal trainer, taught her cats to do tricks using a clicker and plenty of treats. The Acro-Cat shows are popular, and usually sell out quickly. Martin got her start training rats for movies, and in addition to felines, she currently works with reptiles, skunks, groundhogs, bears, possums, and many other animals, including a tightrope-walking chicken and a raccoon that slam-dunks basketballs. Overall, her performances include more than 30 different species. Martin and her animals have toured the U.S. and Europe, and have been featured in a number of television programs, movies, commercials, music videos, and print ads, as well as being hired for birthday parties, corporate events, educational programs, and haunted houses. With more than 20 cats and a variety of other animals living in her home, Martin jokes that she is single and likely to stay that way. Dominique Lefort, commonly known as Dominique the Catman, has trained a troupe of domestic cats to do tricks, and these performances have attracted a cult following and proven sufficiently lucrative to fund his daughter’s higher education. Dominique and his troupe – Oscar, Cosette, Sharky, Sara, Chopin, George, and Mandarine – put on regular outdoor performances in Key West Florida. Dominique often shows up for performances dressed in a theatrical lion tamer outfit, and his cats, many of which came into his care as orphans, leap through flaming hoops and perform other entertaining stunts. Dominique notes that the most difficult aspect of training cats is not teaching them to do tricks, but rather, encouraging them to become comfortable around large groups of strangers. Dominique’s Key West Cat Show draws people from around the world. As with all cat performances, at times the cats make a fool of their trainer, stubbornly refusing to follow a script, but Dominique, a consummate performer, manages to spin the unexpected into part of the entertainment by delivering comical, self-deprecatory lines and making his audience laugh. Thus, the shows are not just a series of animal stunts, but also a comedic performance by their trainer. In 1971, Yuri Kuklachev, who was attending clown school, came across a stray cat that was standing on its hind legs and doing somersaults to solicit food from onlookers. He adopted the stray and made her part of his act with the Moscow State Circus. In 1990, Kuklachev and family established the award-winning Moscow Cats Theater (often referred to as the Russian Cat Circus), a popular attraction that has toured more than 80 countries. The first performers were homeless street and shelter cats that the Kuklachevs adopted. Today, there are 120 cats performing in Kuklachev’s circus, along with a couple of small dogs, looked after by 4 veterinarians and 10 regular caretakers. The Moscow circus cats perform a variety of tricks, including walking tightropes and doing pawstands on Kuklachev’s outstretched palm. They are trained not with treats but with praise and affection, and Kuklachev teaches them to do tricks based on what each of the cats already enjoys doing – whether it is leaping, climbing, or chasing. In addition to regular shows, Kuklachev’s theatre puts on discounted and free performances for war veterans, children’s hospitals, and homes for the disabled. Gregory Popovich and his daughter run a Comedy Pets Theater with various performing pets, all rescue animals the family obtained from shelters. The show, which includes 15 cats and 10 dogs, features a variety of stunts and skits. Headquartered in Las Vegas, Popovich’s show has toured more than 20 countries and won a number of international circus competitions. The cats are treated like members of the family, and Popovich uses their natural preferences to guide which stunts he trains them to perform. Popovich advocates for adopting pets from shelters, and has volunteered his time and that of his performing pets to raise funds for animal welfare organizations. The original keyboard cat video was made many years ago by performance artist Charlie Schmidt. Schmidt dressed his cat in an infant’s shirt and then manipulated the cat’s arms using the shirt to make it appear as though Fatso was playing independently. While the majority of cats would not have tolerated this, Fatso not only cooperated, but appeared to enjoy himself throughout his puppet performance. Keyboard cat’s cheerful, upbeat performance was featured on popular television programs such as The Daily Show with John Stewart, and Fatso was the first individual ever to receive VH1’s “Best Week Ever” award posthumously. Adopted from a shelter by musician Betsy Alexander and artist Burnell Yow!, Nora was named for the surrealist painter, Leonora Carrington. The nascent superstar might have been passed over, as the other shelter kittens had positive notes on their cages such as “Gets along well with children” and “Likes other animals,” whereas Nora’s note just said “Bossy!” Luckily, Alexander and Yow! ignored the unpromising descriptor. With Nora’s skyrocketing popularity, her owners have opened an online shop to sell bags, fridge magnets, and other merchandise with Nora’s image and captions such as “Practice makes Purr-fect.” Nora’s fame has sparked the creation of numerous copycat videos from around the world. Maru, a pleasantly plump, straight-eared Scottish Fold with a teddy bear face, is another feline YouTube sensation whose amusing antics have won an enormous following. Maru’s impromptu performances have a broad appeal, and his videos are currently the tenth-most subscribed of all time in Japan. Maru regularly finds himself in the sorts of ludicrous predicaments that befall any playful cat – for example, getting his head stuck in a small paper bag – but what sets him apart from other felines is his comic timing. Whatever he is doing, Maru appears to be aware that he is playing to an audience. Sockington is among Twitter’s most popular posters, with over 500,000 followers, which is more than many Hollywood celebrities. Sockington’s Twitter account is maintained by owner Jason Scott, a computer administrator who Tweets from Sockington’s perspective. Sockington has been described as a “21st-century Garfield,” with his philosophical ramblings having the quality of an ongoing comic strip. But Sockington’s musings on tuna, catnip mice, sunbeams, and litter boxes can also be seen as a satire of Twitter, where so many posters share the minutiae of their lives in excruciating detail. Sockington’s many fans can purchase T-shirts depicting the cat’s insights about life, and Scott says that “People have come asking Socks to endorse products or speak about causes,” which indicates that the cat’s popularity continues to rise. Sockington shares his home with Sockelganger, a new kitten, and Pennycat, a feisty former stray who once won a fight with a badger. Pennycat has recently established her own Twitter account, which is edging up toward 10,000 followers. To learn more about Pennycat, Sockington, and Sockelganger, visit Sockington.org. This unimaginatively named cat appeared in a number of major motion pictures, most notably, Breakfast at Tiffany’s. He is also the only cat to win two Patsy (Picture Animal Top Star of the Year) Awards, the animal version of an Oscar. Orangey made his debut in the 1951 film Rhubarb, in which he played a cat that inherits a baseball team from his eccentric, wealthy owner. He also appeared in The Incredible Shrinking Man (1957), Gigot (1962), and Village of the Giants (1965), and had a recurring role in the TV series Our Miss Brooks (1952-1958), in which he played Minerva the Cat. Orangey was trained by Frank Inn, whose achievements include training other Patsy winners such as the pig that played Green Acres’ Arnold Ziffel and the dog that played Benji. In total, Inn’s protégés garnered 40 Patsy Awards over the course of his career. For more famous cats, as well as other amusing animal profiles, stories, and facts, see Fun Animal Stuff. For a full list of cat articles, see the main Cats page. For dog articles, see the main Dogs page. Barnett, L. (16 July 2009). “Keyboard Cat Falls Victim to Copyright Law.” LATimesBlogs.LATimes.com. Burnett, T. (14 May 2009). “Twitter Has Gone to the Cats.” WinnipegSun.com. Ciampanelli, P. (6 July 2009). 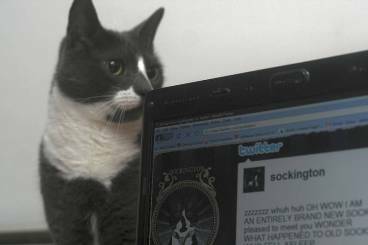 “Sockington is Twitter’s Most Popular Cat.” Pawnation.com. Coyle, J. (22 May 2009). “’Keyboard Cat’ Phenomenon Spreads on Web, TV.” ABCNews.go.com. France24. (19 April 2009). “Circus Cats Play Guitar, Tap Bells, Ride Skateboard.” France24.com. Lefort, D. (1999). “The Catman Website.” CatmanKeyWest.com. Martin, S. (2010). “About Us,” “The Acro-Cats,” “Animal Actors,” “Animal Entertainment,” “Animal Education Programs,” and “Animal Troupe.” AmazingAnimals.biz. Popovich, G. (2008). “World Famous Popovich Comedy Pet Theater.” ComedyPet.com. Raven’s Wing Studio. (2005). “From Shelter to Showbiz: a Meowmoir.” RavensWingStudio.com. Roe, A., Broward/Palm Beach New Times. (n.d.). “The Quest for the Catman.” CatmanKeyWest.com. Smith, D., The New York Times. (17 September 2005). “Roll Over, ‘Cats.’ The Real Thing is Here.” NYTimes.com. The Internet Movie Database. (n.d.). “Orangey.” IMDB.com. Whitwell, T. (3 March 2007). “Microtrends: Piano-Playing Cats.” Technology.TimesOnline.co.uk. Wilson, S., The Boston Globe. (8 June 1997). “Introducing Dominique, the Catman.” CatmanKeyWest.com. YouTube. (n.d.). “Mugumogu’s Channel” (Maru). YouTube.com/user/mugumogu.